AUTO BODY. WOODWORKING. WELDING. YOU NAME IT. Our ambient air cleaner and workshop air filters remove grinding and sanding dust, paint overspray, welding fumes and smoke, plastic body filler dust, wood dust, and other airborne pollutants. 2500 CFM of filtered air prevents clouds of welding smoke, paint over spray, sanding dust, etc. Dramatically reduces the build up of dust on rafters, lights and other horizontal surfaces. Makes the air in your shop 75% to 90% cleaner without using exhaust fans. The MAX 251 workshop air cleaner is supplied with a change filter indicating gauge, 4-eight foot lengths of chain for hanging, a washable pre-filter and axial filter. Wash the pre-filter and axial filter after each 6-8 weeks of use. Replace the primary bag filter annually. One MAX 251 for each 1600-2000 square feet of shop area. Multiple units required in larger workshops. Primary filter may last 1-yr or more without maintenance. Power to clean 1600-2000 sq. ft. of shop area. Pre-installed eyebolts for easy installation. Includes 4 8-ft lengths of chain for hanging unit. US BODY PRODUCTS has available a wide variety of paint booth air filters and replacement air cleaner filters for industrial and commercial use. We have genuine replacement filters for your shop air cleaners and an assortment of types, sizes, and efficiencies to fit almost every application imaginable. Commercial/Industrial disposable filters, bulk filter media, synthetic overspray media, high capacity synthetic overspray media, synthetic deep pocket filters, permanent washable filters, cube filters, high efficiency mini-pleat filters, multi-cell rigid air filters. Over the years Airomax developed a line of filtration products to accommodate industrial and commercial market applications. These units ranged from 500CFM to 20,000CFM. Frequent independent testing proved that the air quality where Airomax was installed always met or exceeded OSHA’s minimum air quality requirements for that facility. 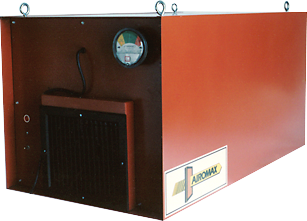 Since 1976, over 20,000 auto body, woodworking, and welding shops have installed an Airomax air cleaning system and over 80,000 Airomax air cleaners have been placed into service. Give us a call or use the form to place an order, for questions, feedback, or support.